The teachers' pension fund invested hundreds of millions of dollars into a company that has foreclosed on and evicted numerous homeowners, including dozens in the East Bay. 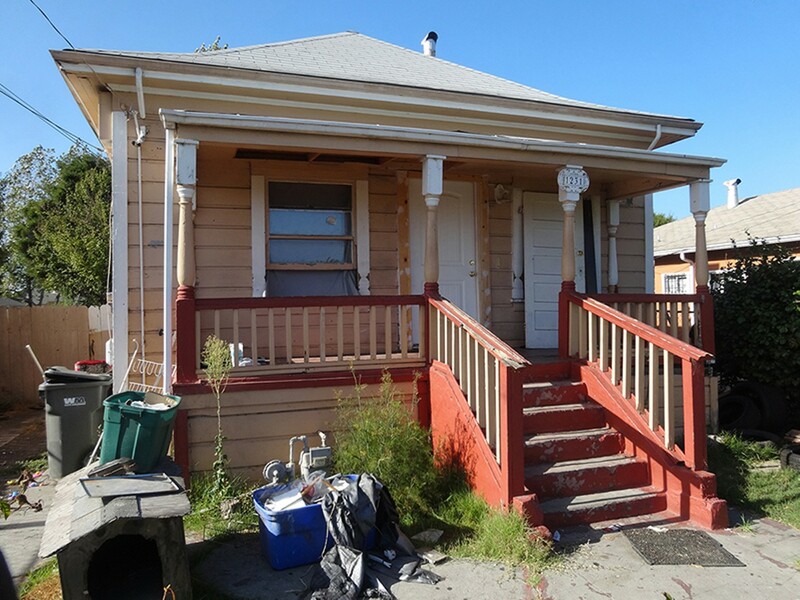 After Lone Star forcelosed on her, Jacqueline Collins' home in East Oakland has fallen into a state of disrepair. California's pension fund for public school teachers invested hundreds of millions of dollars in a company that has been criticized for foreclosing on property owners and kicking them out of their homes, including dozens in the East Bay, records and interviews show. The company, Caliber Home Loans, is owned by the private equity firm Lone Star Funds and was featured in a New York Times story last week because of its controversial practices. In an email to the Express, officials for the California State Teachers Retirement System (CalSTRS) confirmed that the pension fund invested $660 million in two different funds managed by Lone Star, and that the company has used the money to buy up distressed home loans, foreclose on the homeowners, and resell the homes. CalSTRS spokesperson Ricardo Duran said that Lonestar officials have told pension fund managers that the investment has resulted in a lower rate of foreclosure than the industry standard. But according to Duran, CalSTRS has not been provided with data from Lone Star to substantiate these claims. At the same time, complaints made to the federal Consumer Financial Protection Bureau against Lone Star's Caliber Home Loans company have been rising. Complaints jumped from 191 in 2013 to 428 in 2014. So far this year, Caliber has been the subject of 433 complaints. And according to The Times, Lone Star has foreclosed on at least 1,500 of the loans it has purchased from the federal government and government-sponsored housing agencies since 2010, and most of these foreclosures have been initiated in the last five months. In Alameda County, according to public records we reviewed, Lone Star, through multiple entities with obscure names such as "LSF7 Bermuda NPL III Trust," owns dozens of mortgages. These entities have been named in official county documents recording the foreclosures of upwards of sixty homeowners in Oakland, San Leandro, Hayward, and other East Bay cities. Over the years, Lone Star has relied on billions of dollars from public employee pension funds to buy out "distressed" home mortgages. And CalSTRS, which manages the retirement savings of 879,000 California public school employees, is among Lone Star's biggest investors. The scale of Lone Star's mortgage business is dizzying. Lone Star has purchased 18,747 mortgages worth $3.16 billion from the federal government and government-sponsored housing agencies since 2010, according to records maintained by the US Department of Housing and Urban Development (HUD). The acquisition of these mortgage loans was made through a government program that policymakers claim was intended to reduce foreclosures — not make them worse. One of the homeowners impacted by Lone Star's actions in the East Bay was Jacqueline Collins, a senior citizen who had owned a home in the 1200 block of 80th Avenue in East Oakland since 1987. Lone Star acquired Collins' mortgage in one of the pools of loans it bought from the federal government, and then foreclosed on Collins in May of this year. We visited the house last weekend. It appeared blighted and empty. The front yard was strewn with trash. A chicken wandered the driveway. A window facing the street was half open. Several lock boxes were fastened to the fence. Two men setting up tables in front of the house next door for a children's birthday party said Collins' foreclosed home has been empty for months, and it's not clear when it will be sold or inhabited again. One of the men, who identified himself as Wally, said Jacqueline was his grandmother. "Squatters and homeless people crawl into the window at night to sleep inside," said Wally, who declined to provide his last name. "My grandmother, she just couldn't make the payments anymore. I remember the day the sheriffs came to move her out, I didn't think she was gonna leave, but she had to." We were unable to track down Collins for this report. It's unclear what has happened to her since her eviction, but her former home has fallen into a state of disrepair. Caliber Home Loans is run by former officials from Countrywide, the disgraced home loan company that played a central role in the financial crisis of 2008. Last year, the Los Angeles Times highlighted the problems associated with private equity's attack on financially troubled homeowners. And last week, Senator Elizabeth Warren accused HUD and the Federal Housing Financing Agency of "lining up with the Wall Street speculators." According to The New York Times, demonstrations are planned for next week outside Lone Star's headquarters in Dallas, Texas. According to CalSTRS records, the pension fund first made an investment in Lone Star in 2004 when it committed $360 million in teacher retirement savings. Then in 2008, just as the foreclosure crisis was ramping up, CalSTRS committed another $300 million in a second Lone Star investment fund that was used to buy mortgage securities. Duran, the CalSTRS spokesperson, wrote in another email to us that the pension fund's investment staffers were aware that Lone Star has been pursuing a "distressed situations" investment strategy, involving the acquisition of thousands of mortgages packed into securitized pools with high rates of default, and that foreclosing on some of these mortgages was a possibility. "Not every loan can be reworked," wrote Duran. "However, CalSTRS continues to monitor the situation and is in close contact with Lone Star on the matter." A spokesperson for Lone Star and Caliber provided the Express with a statement from the company via email. "Caliber has one of the highest loan modification rates, and lowest re-default rates, in the residential mortgage servicing industry," Caliber claimed in the email. A high rate of loan modifications and low rate of defaults would mean that Caliber is foreclosing on homeowners less frequently than other companies. "Foreclosure, while a necessary action in certain cases, is the least attractive outcome for Caliber Home Loans and its investors, and the Company is incentivized to avoid that outcome whenever possible." We asked Lone Star for data supporting its claim that its mortgage business has a high loan modification rate, and a low default rate. The company did not provide the data by our deadline. Homeowners whose loans have been bought by Lone Star have been among its harshest critics. Two of these homeowners, Charles and Pamela Hubbard, residents of Sacramento whom The New York Times said had "briefly lost their home when Lone Star's Caliber subsidiary dealt harshly with their request for a loan modification. The couple said they had submitted the application to reduce their monthly mortgage payments four days before a planned foreclosure sale, but the Lone Star subsidiary said the Hubbards had been late in completing the application and pushed ahead with the sale. Within a month, the three-bedroom house that the Hubbards had lived in for two decades was auctioned off to another affiliate of Lone Star with the right to resell it later. The foreclosure was rescinded only after the couple went to court." CalSTRS' investments in Lone Star's "distressed situations" strategy targeting home loans is part of a pattern of private equity and hedge fund investments made by the teachers' pension fund that squeeze middle-class Americans to turn a profit (see "Financing the Destruction of American Lives," 6/17). CalSTRS, which also has come under fire in recent years for its large investments in gunmakers and its backing of Wall Street corporate raiders, has argued that it must engage in these activities in order to earn a sufficient financial return on its investments so it can pay the pensions of California teachers. But this claim has recently been exposed as questionable. The well-respected blog NakedCapitalism.com has revealed that CalSTRS, along with other public pension funds, has no real idea of its financial relationship with private equity, including what it pays in fees to firms like Lone Star, or the actual financial return it gets from investing in their strategies. All of this has teachers worried about what their retirement savings are invested in. Fred Glass, communications director of the California Federation of Teachers, said his union was unaware of CalSTRS's investment in Lone Star, and that his members generally don't appreciate having their retirement savings invested in predatory corporations. "Tracking every dollar in a fund the size of CalSTRS is a daunting task," he said, "but CFT does try to steer the system away from holdings whose values don't match up with ours."